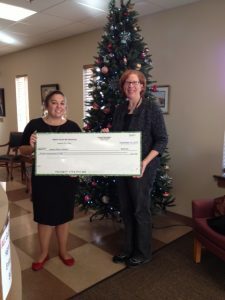 Members of the Lebanon County Bar Association donated $500.00 to the Lebanon Rescue Mission recently. The organization’s mission is to “serve through shelter, nourishment, clothing, education and healthcare” and its ministries include a men’s shelter, Agape Family Shelter, and Lebanon Free Clinic. In the photo, Rescue Mission Executive Director Susan Spahr, right, accepts a check from attorney Heather Eggert, a member of the Lebanon County Bar Association Public Relations Committee.